Madison the dog is seen in this undated image patiently guarding the property where his home was destroyed by the Camp Fire. 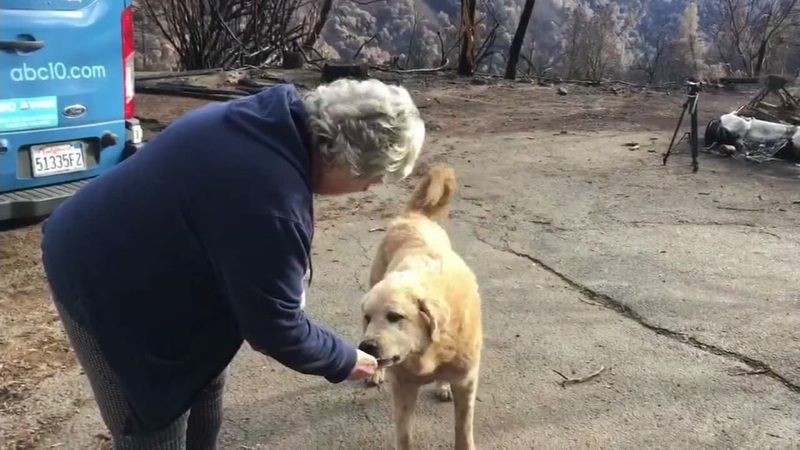 PARADISE, Calif. (KGO) -- Many of us have heard the story of Madison, the Anatolian Shepherd who lost his home in the Camp Fire and yet guarded that property for weeks awaiting the return of owner Andrea Gaylord. "Imagine the loyalty of hanging in through the worst of circumstances," she told reporters. Ever wonder about the why and how? "Well some dogs have been known to wait for weeks and weeks," Trish King told us. She's a canine behavior consultant. We caught up with her while making a house call on Buddy Hoffman's terrier puppy named Rocket. "We're trying to teach him some manners," said Buddy. He, too, had heard Madison's story. After the fire, Madison's brother, Miguel turned up in shelter miles away, while he stayed close to the burned property. Trish told us that behavior fits the Anatolian Shepherd. "This particular breed is about making sure that what belongs to them stays theirs, and they are there to protect it." Only, it's more complex. For both humans and dogs, the loss of a home to fire is traumatic, but the two species process such events differently. While we both feel the same emotions, humans tend to analyze them. Dogs live in the moment. Andrea Gaylord is seen with her dog Madison in this undated image. "In this case the dog is going to go to its home, recognize some of the stuff around the home and because they were people who loved him, they will stay there and wait," explained Trish. Madison had one other working factor in his favor. Sheila Solvin, who rescued her brother, went regularly to the burned lot and left food. That made the difference. "By the grace of God, we made it," said Andrea Gaylord. Man's best friend, and vice-versa. Let no fire put asunder. "We have been together with these animals for 17,000 years," said King. "That's a long time." VIDEO: Why did dog loyally guard destroyed home for weeks after Camp Fire? Madison the dog watched over his destroyed home for weeks after the Camp Fire destroyed Paradise. But why? A canine behavior expert has a possible explanation.